Lester's Fixins Bacon Soda, and Snooki's Wild Cherry. 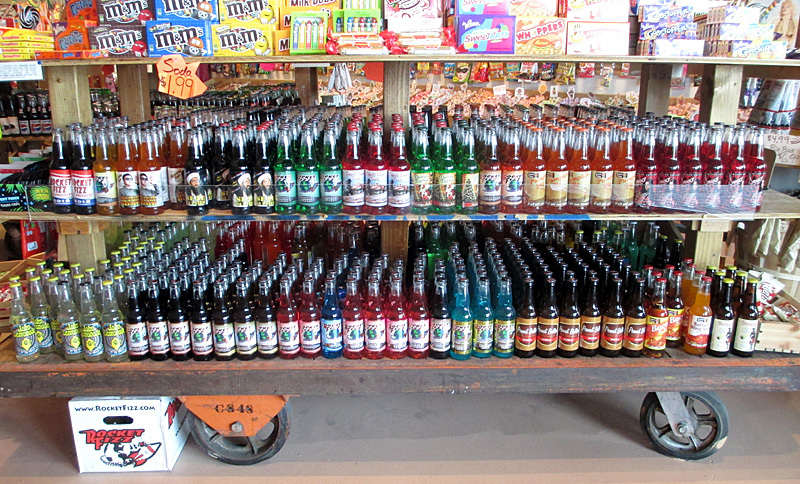 Purchase Place: Rocket Fizz, Las Vegas, NV. Review: Really smooth, and really caramely. I'm not into that much caramel flavor, but the smoothness was nice. Good amount of head. 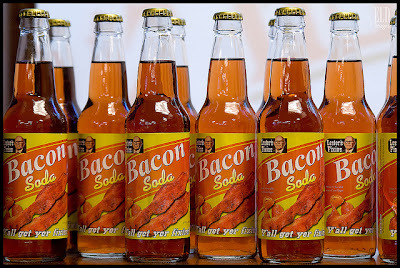 Lester's Fixins Bacon Soda. Yes, BACON Soda. Alright... It was our last day in Vegas, and it was time to get adventurous. 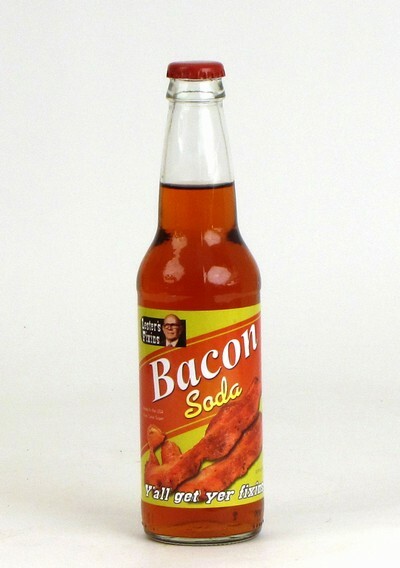 I busted out the Bacon Soda. 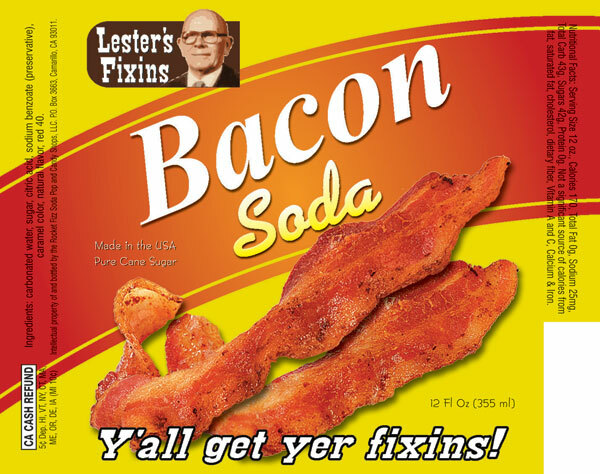 Brand: Lester's Fixins Bacon Soda. Review: It didn't taste like bacon. It tasted like Bac-Os or Bacon Bits... only in liquid form... with carbonation. That's all a nasty combination. It was salty and smoky, much like bacon (or a hairy, sweaty, Russian man). But in soda form, this is just disgusting. I took 2 tiny sips and had to dump the rest. Lester's Fixins Sweet Corn Soda had slightly more (better) flavor, but I could not stomach this. I'm taking a quick break from my handful of posts about the sodas I drank in Vegas. Today, I want to give a quick "shout out" to a great new ice cream shop on Riverfront Drive in "Old Town" Mankato, MN. Two freezers of homemade ice cream. And fudge. And coffee. 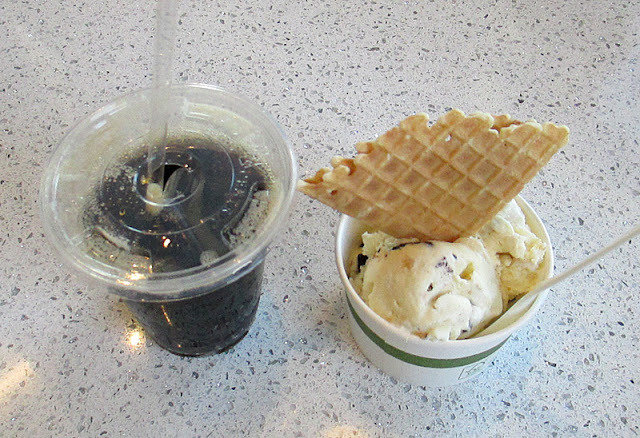 Small root beer and small cup of ice cream. Life is good! "Mom" and "Pop" both came over to chat with my family for a moment. They've been open about a month. Look them up and stop by to check them out! 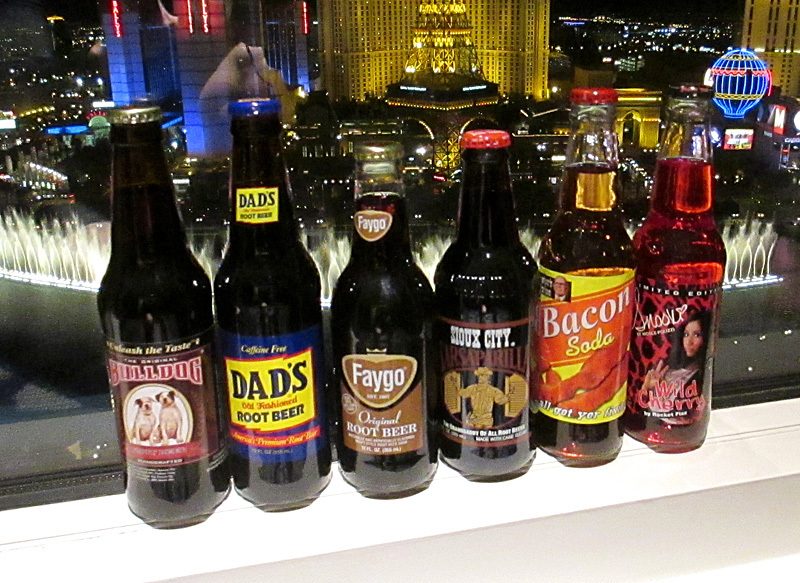 Onto my 3rd soda purchased in Vegas... Faygo Root Beer. 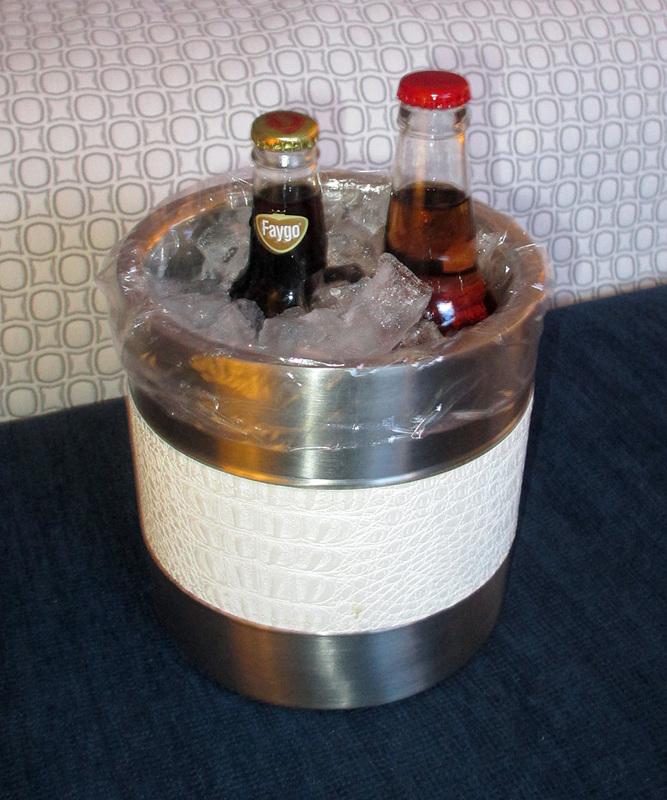 My Faygo and another soda on ice in our Vegas hotel room. I really like Grape Faygo, but I'd never had their root beer. Time to try it out. Brand: Faygo Original Root Beer. Review: The first taste is perfect. PERFECT! (It reminds me a bit of Root Beer Barrels - the candy.) But then it has a strange aftertaste that I can't put my finger on. My wife completely agrees with this assessment: great at first, and then not quite right 2 seconds later. Still, pretty damn good overall. So far, my favorite of my 3 "Vegas" sodas. Snooki in the bathroom of our Vegas hotel room. Yeah, I can't believe I bought it either. I do NOT like Snooki (or Jersey Shore), but based on the sheer randomness that Snooki has her own soda led me to try it. I'm not proud of it. But that's what I did. 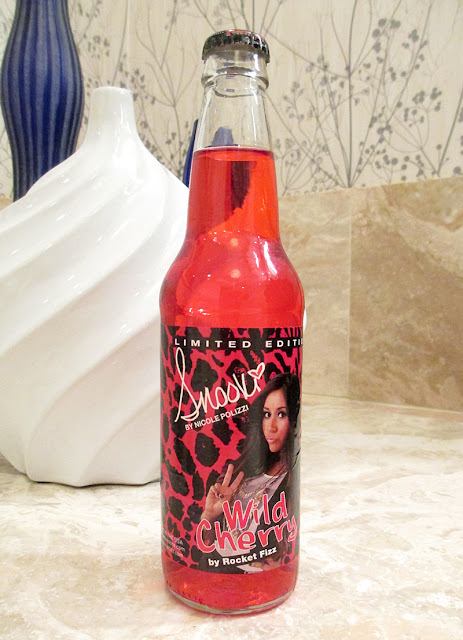 Brand: Snooki Wild Cherry (by Rocket Fizz). Origin: Camarillo, CA (I think... it's not well labeled). Bulldog in the bathroom of our Bellagio hotel room. 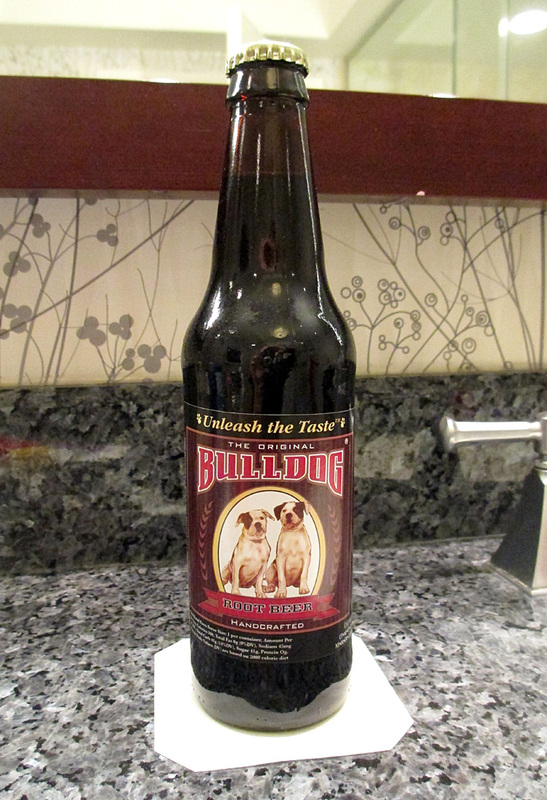 Brand: Bulldog Handcrafted Root Beer. Review: REALLY creamy. Nice vanilla flavor. It's not perfect, but if you like "creamy," then you'll like this! My wife and I just got back from 4 days in Vegas. 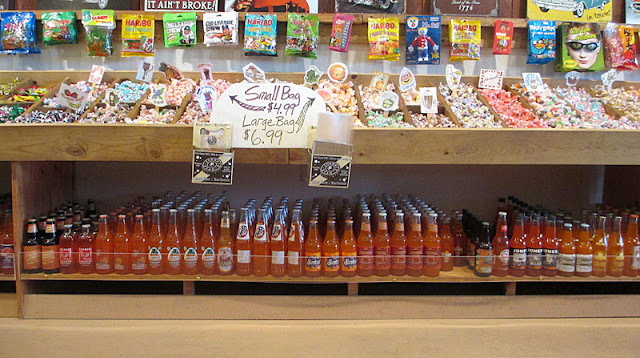 Our trip included a stop at Rocket Fizz Soda Pop and Candy Shop. This is ALL Root Beer!! 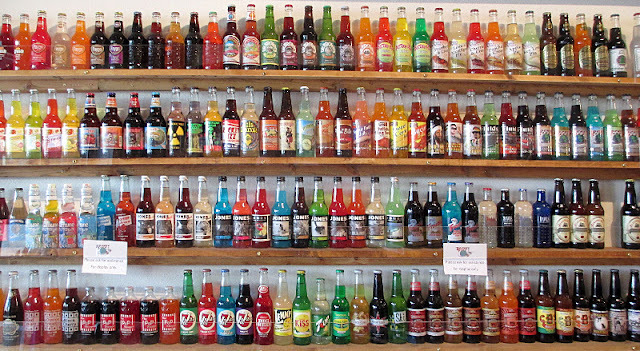 All of their individual kinds of soda on the wall. They had 3 carts of soda like this! Here's a selection of 15 different kinds of orange soda (under some taffy). 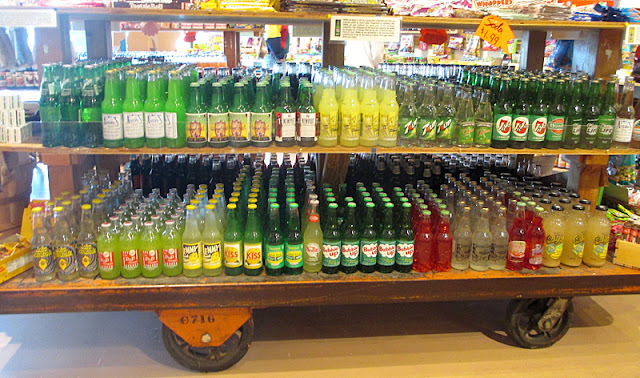 Over 20 kinds of Lemon Lime soda. At my count, I've had 6 of these. 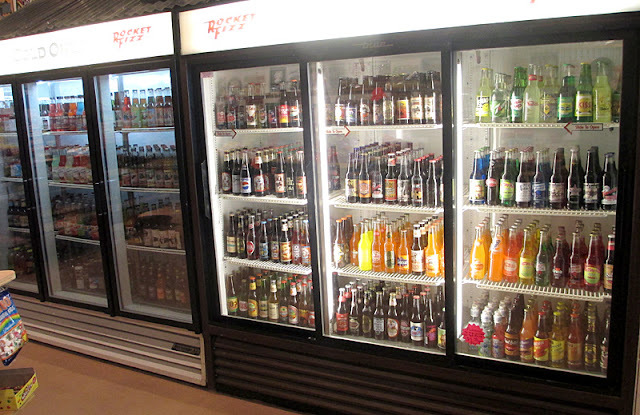 Lots of bottles in the coolers in the back. My 6 sodas sitting in our hotel room over-looking The Bellagio's fountain. So I'll be posting my reviews of all of these over the next week or 2. 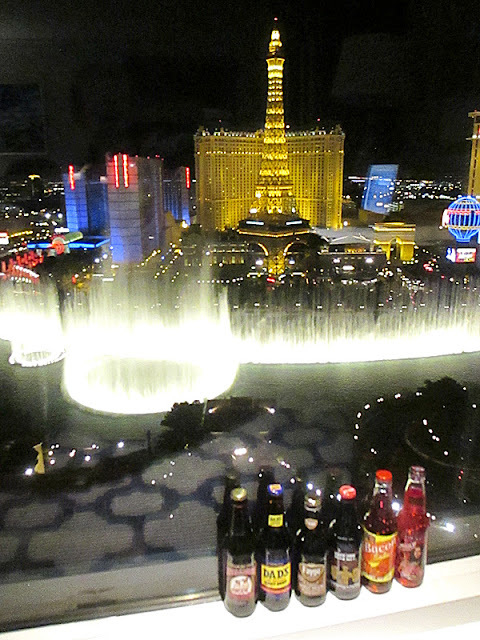 Stop by to see what I thought of my Vegas sodas. Thanks for stopping by the fountain and writing the review. I am sorry you got a Root Beer with ice in it. I will send out a memo to all of our jerks to remind them that you never put ice in the Root Beer. Our root beer actually is not mixed it comes straight from a keg through the cold plate in the fountain. I always recommend enjoying it in a glass rather than a plastic cup. 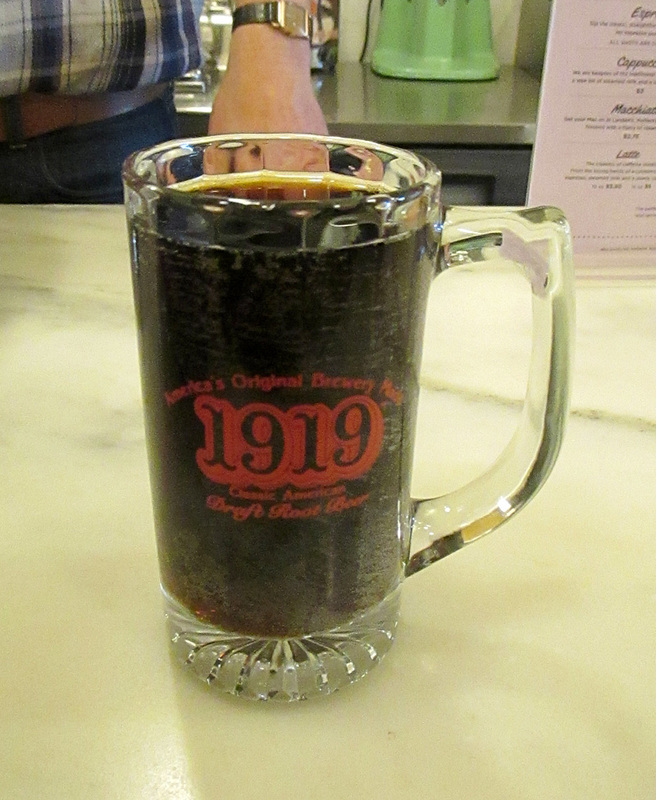 I would like to invite you back for another root beer on the house and I would also like you to try our Sarsaparilla. So my whole family stopped back yesterday. My son's first 1919 Root Beer - he couldn't stop drinking it! 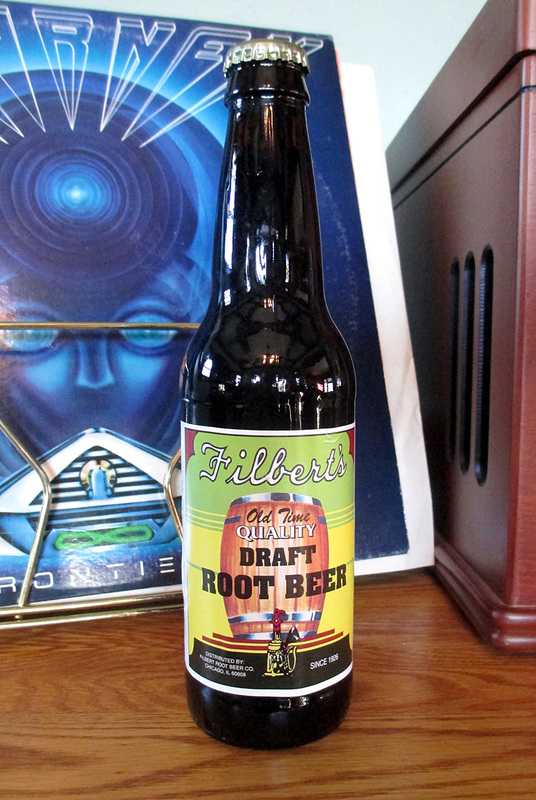 The Sarsaparilla and (partially drank) Root Beer. 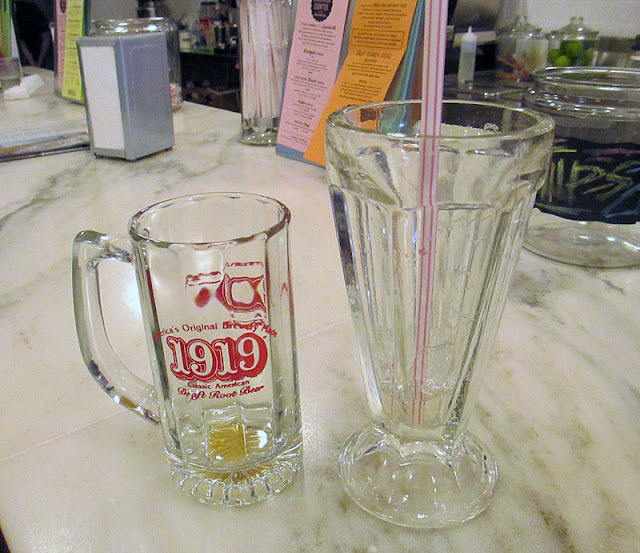 The Root Beer WAS better in the glass and withOUT ice. John told me that he doesn't like ice in his drinks, and I told him I'm the same way. 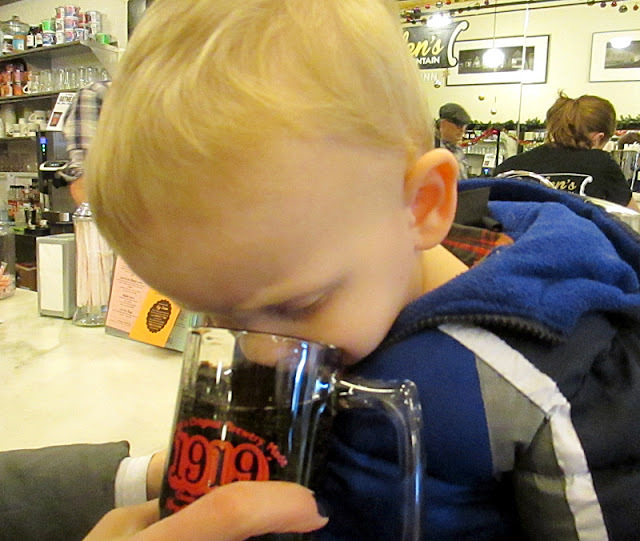 He especially doesn't like ice in his Root Beer. John and I will get along juuuuust fine. The Sarsaparilla was very "herby" and spicy. I thought it had a lot of wintergreen, and my wife thought it tasted a bit of cinnamon. John said it had a lot of Sarsaparilla root in it, and that was probably the flavor. It was unlike any Sarsaparilla I've had from a bottle. 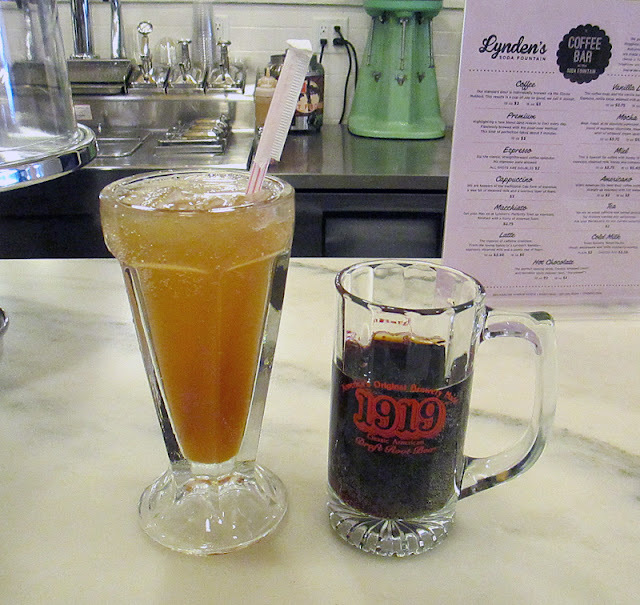 Lynden's Sarsaparilla is from a small company in Brooklyn - they provide the syrup and Lynden's adds the carbonated water. 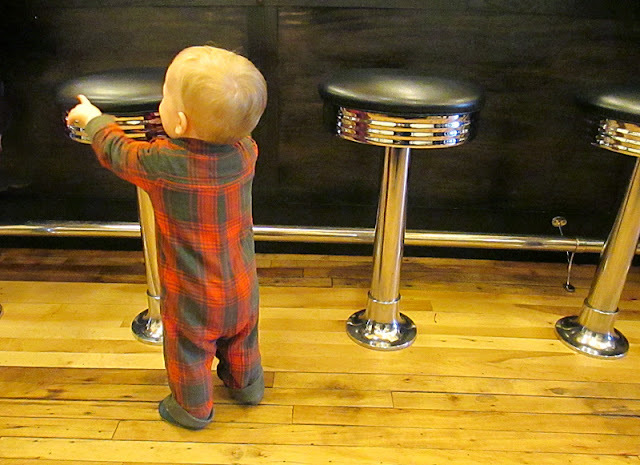 Henry loved to spin the stools (once he was "sugared up" on lots of root beer)! 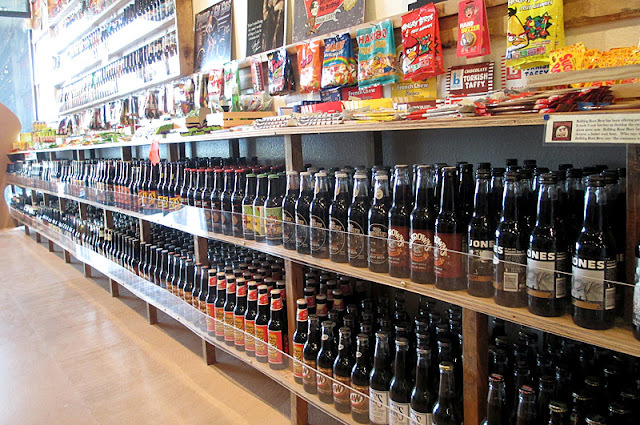 Brand: Lynden's Sarsaparilla and Root Beer. 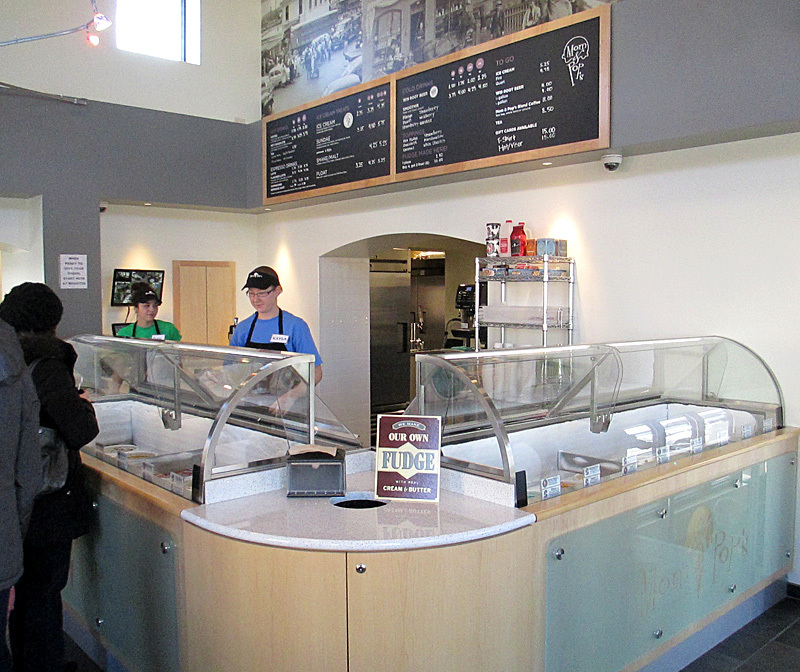 Purchase Place: Lynden's Soda Fountain, St. Paul, MN. Review: I originally gave the Root Beer a 7.5 out of 10 in my post last week, but I'm bumping that up a point because it IS better in a mug and without ice. The Sarsaparilla is very herby, spicy, and "sharp." I need to drink more from a soda fountain, because everything seems to taste "crisper." I sort of wish it were smoother, but I did like the sharpness. Root Beer: 8.5 out of 10. 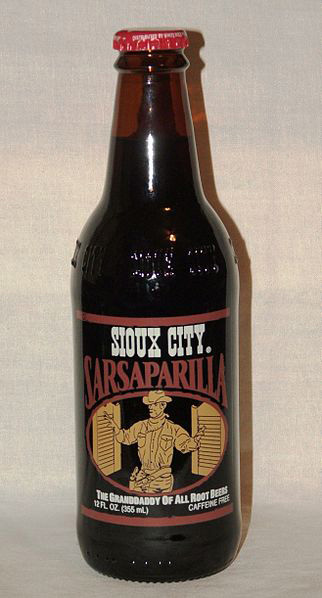 Sarsaparilla: 7.5 out of 10.
p.s. I STILL need to head back to Lynden's for a Lime Rickey. And some more candy. I'll be writing about them again within the next few months for sure..... And a BIG THANKS to John Lynden for inviting me back! Yes, that's a Journey record in the background. Don't judge. Brand: Filbert's Old Time Quality Draft Root Beer. Sweetener: Sugar and/or corn sweetener. Review: Classic taste. Not much of a bite, but nice and smooth. Very little anise flavor (just the way I like it!). The ONLY downside is there's a slightly strange aftertaste. Otherwise, this is pretty great! 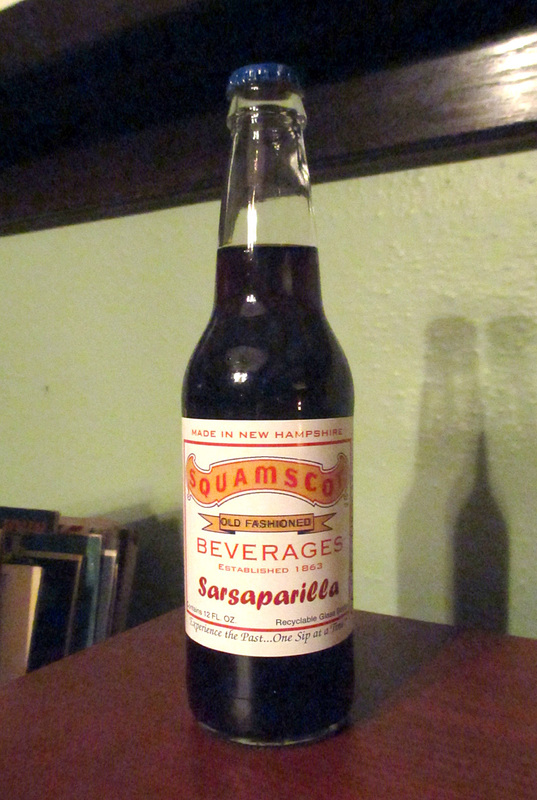 I was in the mood for some sassy sarsaparilla. Review: This first had a slightly strange taste that I wasn't sure I liked. But it quickly grew on me. 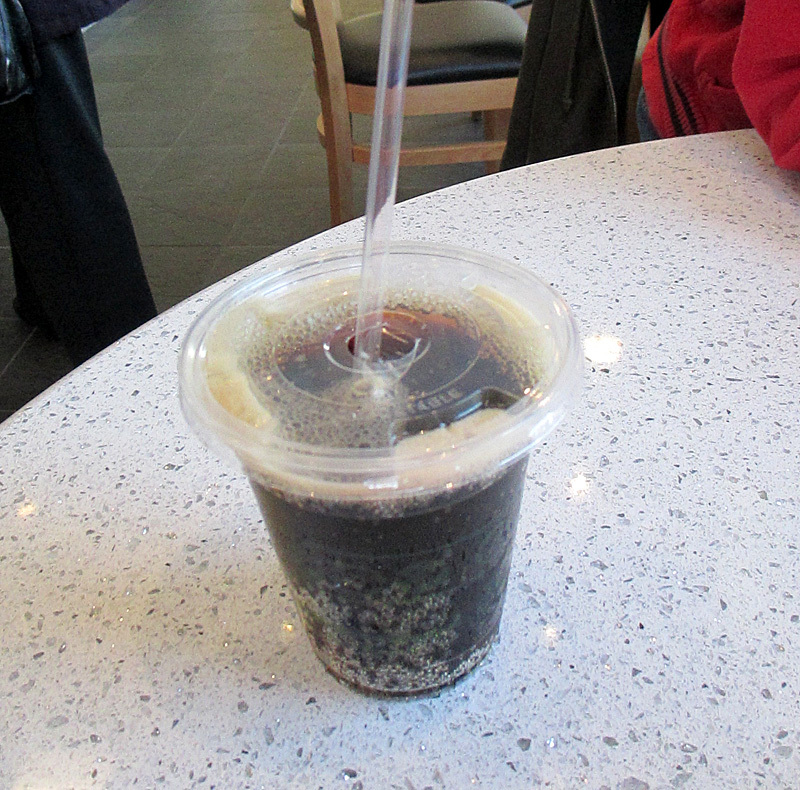 I realized that it tasted slightly like "herby" cola, and not quite as much like sarsaparilla as I'd like. But it wasn't a bad flavor. 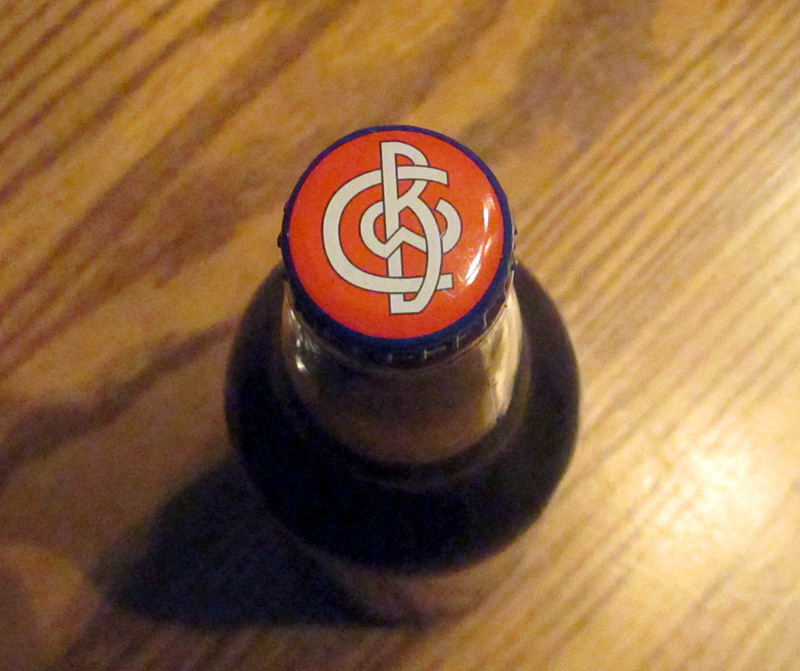 I ended up enjoying the rest of the bottle, but I DO wish it tasted a little more like sarsaparilla. It was GOOD! But it got a little weaker as I went (partially due to the ice, but I think mostly because I'd sucked up most of the syrup in the first half). 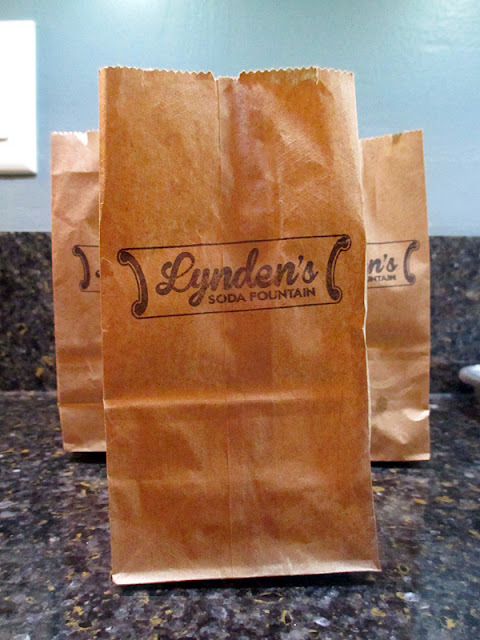 You grab a tiny little paper bag (hand-stamped with "Lynden's Soda Fountain") and throw in whatever mix of candy you want. My wife and I got 3 small bags with cola gummies, sour cola gummies, "lipstick" candy (my wife used to love that, but I'd never heard of it), and some chocolate covered expresso beans. Our 3 little bags at home. We liked that we could pick as little as we like, because we both just like a "little" treat now and then. We spent just over a dollar on that candy. When we go back to Lynden's, I need to try a "Lime Rickey" made with fresh lime juice. Or maybe a Raspberry Lime Rickey - that was recommended by the high-school or college-aged girl working behind the counter. 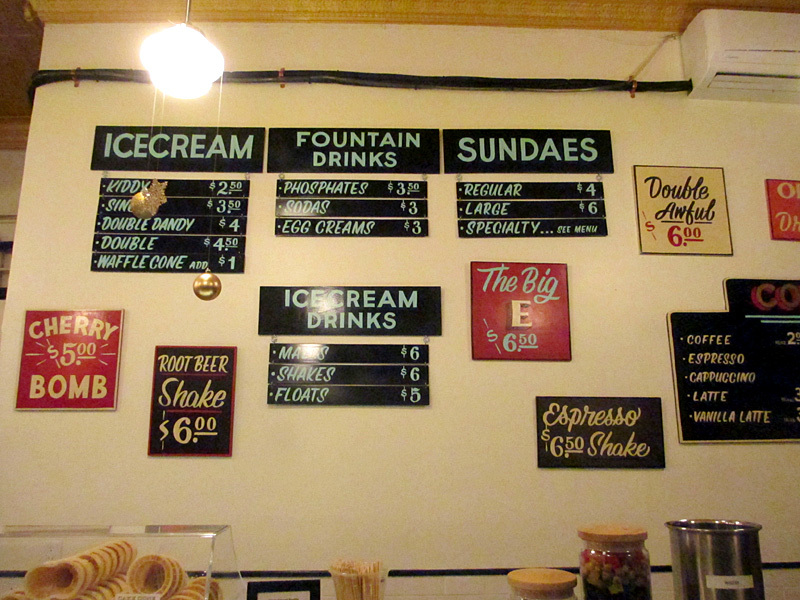 They also have ice cream, egg creams, phosphates, coffee, etc, etc. Brand: Lynden's root beer soda syrup and carbonated water. 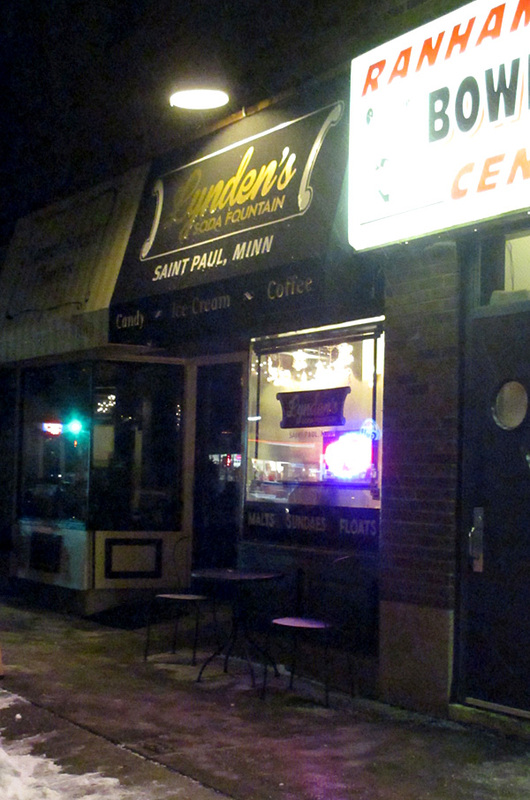 Purchase Place: Lyndens's Soda Fountain, St. Paul, MN. Sweetener: Their Facebook page notes their homemade syrups are made with cane sugar, but I'm not sure about this root beer syrup. Review: Sharp. "Fresh." 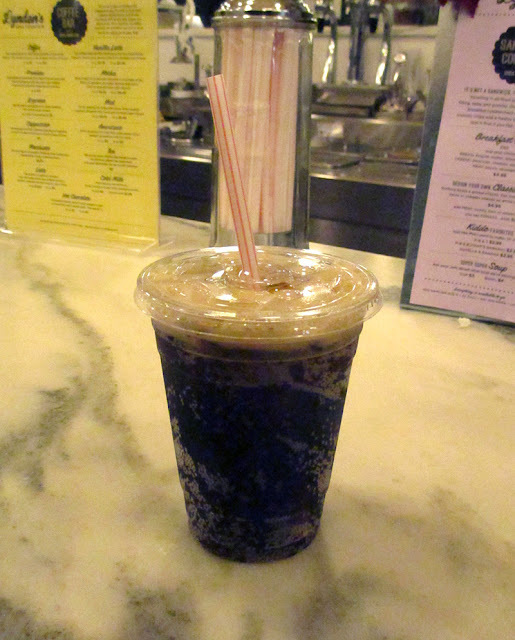 It was "strongly" carbonated because it was just made from the soda fountain (which is an antique!). It wasn't the BEST ever, but it was good. 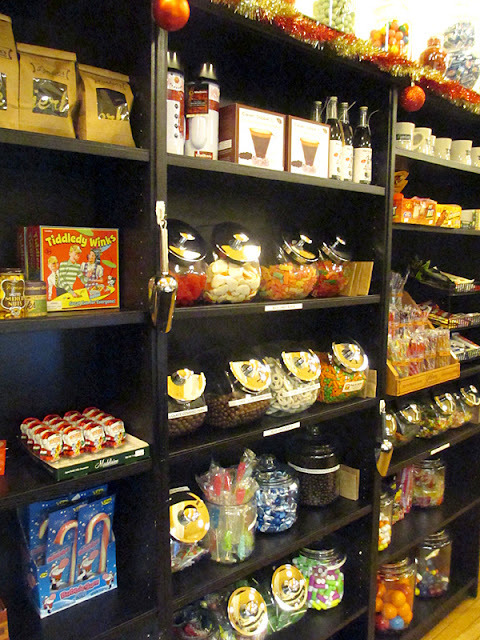 And it's quite a great little store. My wife and I WILL be back to try some of their other concoctions. p.s. I heard about this place for the first time because they were on the news for "illegally" selling candy cigarettes - something you apparently can't do in St. Paul. I asked the young woman working behind the counter if people have been coming in and saying "I never knew you were here until I saw you on the news!" She smiled and said something like "No one has come right out and said that, but I'm pretty sure we've had people in because of that!" 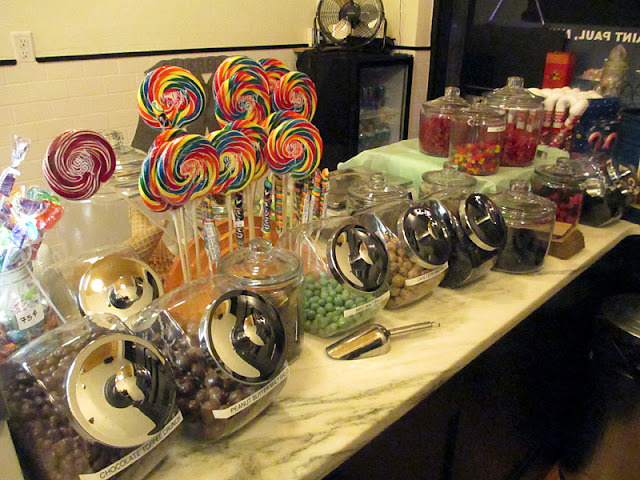 The video on their website shows a quick glimpse of the candy cigarettes, but now they're no longer in the store. Dang. We do a gift exchange at Christmas with all of the siblings in my wife's family. We draw names, and we also list a small item we'd like as a gift under our name. All I asked for was "root beer." Really. 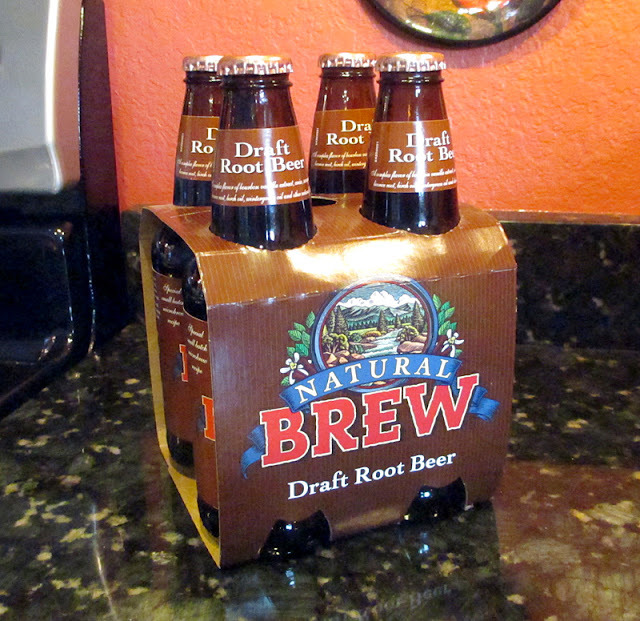 So I got a 4 pack of Natural Brew Draft Root Beer along with a $25 Visa Card (that I'll ONLY be spending on root beer or other sugary items). Sitting on the counter at my parents house on Christmas. The bottle says "A complex flavor of bourbon vanilla extract, anise, sarsaparilla, licorice root, birch oil, wintergreen oil and other natural flavors." And as that statement would imply, there's just too much going on with this root beer. Purchase Place: Hy-Vee Grocery Store. Review: Too much wintergreen. And too much anise. Too much of a lot of stuff. There's just too much going on. Dislike.